Congrats Laurel! 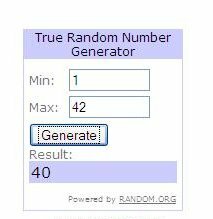 You won our sock kit give away! Below is the proof, you can see for yourself Laurel won fair and square via the random number generator. So happy for her, and we'll be sending her kit in the mail shortly.